Conor McGregor knocked out Jose Aldo after just 13 seconds at UFC 194 to win the featherweight title in Las Vegas. Irishman McGregor, 27, beat the long-time champion by landing a strong left hand with his first connecting punch to secure the fastest ever knockout in a UFC title fight. 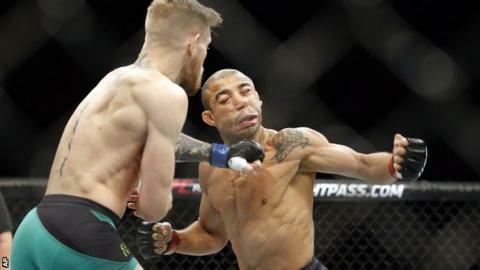 McGregor claimed in the build up to the fight that he would "embarrass" Aldo with a first-round knockout. "Precision beats power, timing beats speed," McGregor said afterwards. "I feel for Jose. He's a phenomenal champion. He deserved to go a little bit longer." It was also Brazilian Aldo's first defeat in 10 years after winning 18 straight fights. Dubliner McGregor has been credited, along with former women's bantamweight champion Ronda Rousey, with widening the appeal of mixed martial arts. Before the fight, he described his meeting with Aldo "as one of the biggest in combat sport history". He also told BBC Sport that he expected it would generate upwards of $100m (£65.7m).